Lassus, Victoria and Schütz composed the only Passion settings before Bach that retain currency. This enterprising release presents two still earlier versions by composers working in the last decade of the 16th century and proving that, when it comes to Passions, small can still be beautiful and meaningful. Working in the Lutheran chapels of Carinthia, Johannes Heroldt (or Herold, c1550‑1603) produced a motet Passion which begins (as did Bach) in the Upper Room and ends, not a quarter of an hour later, before the Deposition. Interleaved with the recitation are two chorale texts sung homophonically, the first being ‘O Mensch, bewein dein Sünde gross’, set to a tune familiar to anyone who has sung ‘All creatures of our God and King’. The motet sections are mostly homophonic but not without rhythmic variety as they slip in and out of triple metre, with distinct registers of texture assigned to different actors in the drama. 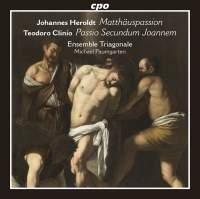 The St John Passion by Teodoro Clinio (d1602) is a less rewarding affair which follows the same model as Lassus, being sung on a recitation tone by a tenor with brief polyphonic interventions to represent the crowd, Christ, Pilate and so on. As a polyphonist, Clinio (an ordained musician working in Treviso and its environs) is not so affective as Lassus, but there remains much to be done in the way of characterising each voice without doing violence to the sure progress of the polyphony. The six voices of Ensemble Triagonale (one soprano, the rest men) are entirely stylish in the matter, discreet in attack and cleanly tuned. The tenor to whom the recitation has been assigned (who may be the ensemble’s director; it isn’t clear) is a little dry – not inappropriately so – but sensitive to the rhythm of the story as the pace slows and the perspective widens towards the climax. CPO’s presentation is exemplary. There are useful essays giving historical context to each piece, sung texts and translations, session photographs and brief biographies that actually tell us something about the singers rather than offering the usual tedious list of their engagements.